Atlantis SquarePants: Altantis SquarePants: 2 Part Episode, An ancient medallion helps SpongeBob and pals get to Atlantis, home to The Oldest Living Bubble. When Patrick accidentally pops the bubble, everyone's on the run from the Atlantean Guards. The Krusty Plate: Out, out darn spot! SpongeBob refuses to leave work until he gets a stubborn spot off one of the dishes. Pat No Pay: When Patrick eats his weight in Krabby Patties without.. Tea At The Treedome - Sandy invites SpongeBob to her glass enclosed home for the first time. Unfortunately, the treedome is filled with air. Great for squirrels but could prove lethal for a sponge! Mermaidman And Barnacleboy - When they discover television superheroes Mermaidman and Barnacleboy living in a rest home nearby, SpongeBob and Patrick try to convince the duo to come out of retirement. Culture Shock: Squidward plans and host..
SpongeBob SquarePants-SpongeBob And The Big Wave - SpongeBob And The Big Wave: Swept out to sea by a giant wave, SpongeBob and pals must learn to surf or be stranded on a remote island forever! A Life In A Day: SpongeBob and Patrick add adventure to their dull lives by “livin' like Larry” and boy does it hurt! Sun Bleached: SpongeBob and Patrick can't attend the biggest party on Goo Lagoon because they aren't tanned...yet. Giant S..
Altantis Squarepants: 2 Part Episode, An ancient medallion helps SpongeBob and pals get to Atlantis, home to The Oldest Living Bubble. When Patrick accidentally pops the bubble, everyone's on the run from the Atlantean Guards. The Krusty Plate: Out, out darn spot! SpongeBob refuses to leave work until he gets a stubborn spot off one of the dishes. Pat No Pay: When Patrick eats his weight in Krabby Patties without paying, Mr. Krabs put..
Own Spongebob - Cast Mug from Deff, DVD, Blu-Ray & 4K Video Specialists - Free UK Delivery..
Own Spongebob - Expressions Mug from Deff, DVD, Blu-Ray & 4K Video Specialists - Free UK Delivery..
Own Spongebob - Faces Mug from Deff, DVD, Blu-Ray & 4K Video Specialists - Free UK Delivery.. Friend Or Foe? : It's the history of the Krabs/Plankton rivalry! Mr. Krabs and Plankton were once best friends, but things went bad when they tried going into business together. With a special appearance by Patchy! The Original Fry Cook: The Krusty Krab's original fry cook, Jim, stops by. Now SpongeBob is convinced Jim is taking his job. Night Light: When SpongeBob reads a scary book before bedtime, everything starts to go bump in the ni..
Own Spongebob - Gary Mug from Deff, DVD, Blu-Ray & 4K Video Specialists - Free UK Delivery..
Own Spongebob SquarePants - Halloween DVD from Deff, DVD, Blu-Ray & 4K Video Specialists - Free UK Delivery..
Back To The Past: Mermaidman and Barnacleboy show SpongeBob and Patrick their locker of memories with the warning not to touch anything. Someone didn't listen! The Bad Guy Club For Villains: With the Dirty Bubble, Man Ray, the Atomic Flounder and the Sinister Slug on their way to Bikini Bottom, this can only mean one thing. But what? Keep Bikini Bottom Beautiful: Squidward cleans up the city of Bikini Bottom with ""help"" from SpongeBob..
Bikini Bottom is being invaded... and only SpongeBob and his pals can save the city! Join them as they fend off a giant purple ball of goo, an evil Jellien overlord, some terrifying sea whelks, a nasty sea urchin, a pair of evil villains and more! Includes: It Came From Goo Lagoon Planet of the Jellyfish Whelk Attack Eek, an Urchin! Don't Look Now Super Evil Aquatic Villain Team Up Is Go! Hide and Then What Happens? Special Features S.. It's SpongeBob, Patrick, Plankton, and Bikini Bottom - as never seen before - in this soon-to-be classic! At Christmas time in Bikini Bottom, everyone's excited. Well, everyone except Plankton who, year after year, gets the same gift from Santa: a lump of coal. But he vows this will be the year he finally gets his Christmas wish - the Krabby Patty formula! And he won't be doing it by being good. Nope. He's gonna make everyone else in Bi..
Join SpongeBob and friends on their legendary adventures and through the ages!! SpongeBob Goes Prehistoric: SpongeBob BC: Patchy introduces this episode featuring the prehistoric Spongegar, Patar and Squog. The trio discovers fire. And it burns. But they also discover that it's great for roasting marshmallows! 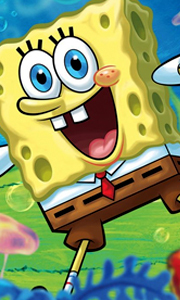 Nature Pants: SpongeBob takes off to Jellyfish Fields to live amongst the jellyfish. Fools In April: It's April Fool's Day, and.. Gather ‘round for a spine-tingling adventure (if you have a spine, that is) unlike any you’ve ever seen before! Hang on as SpongeBob, Patrick, and the rest of their Bikini Bottom friends dive into SpongeBob’s Legends of Bikini Bottom. You’ll squirm when Patrick and SpongeBob find themselves held prisoner by a backward gang, SpongeBob and pals look for a way out of the Bikini Bottom Triangle, and an evil hag curses the Krusty Krab! Then ..
Ripped Pants: SpongeBob tries to impress Sandy at Mussel Beach, and accidentally rips his pants! He's embarrassed until he realizes the crowd thought it was a joke he did on purpose! His ripped pants are a hit, but the joke gets old, fast. SB-129: Squidward flees to the Krusty Krab in search of quiet and winds up frozen in the freezer. When he finally thaws, he finds himself far into the future and wondering how to go back! Texas: San..
Pest Of The West: While researching his family tree, SpongeBob discovers he was related to Western hero, SpongeBuck. Flashback to SpongeBuck arriving in Bikini Gulch around 1882 and going head-to-head against dastardly Dead-Eye Plankton. Money Talks: Mr. Krabs makes a wish that he could talk to money. When his wish is magically granted, Krabs learns (to his horror) what all of his dollars, pennies and quarters have been longing for: the.. The Fry Cook Games: SpongeBob's representing the Krusty Krab in the Fast Food Olympics. Representing the Chum Bucket, his challenger ... Patrick! It remains to be seen whether SpongeBob and Patrick's friendship can stand the test of this ultimate competition! Bubblestand: SpongeBob wants to introduce Patrick and Squidward to the fine art of bubble blowing. And for just $.25 a lesson, he'll prove that the art of blowing a perfect bubble..
Fire up the grill for 7 tales that include SpongeBob getting fired, Mr Krabs giving out free samples, Plankton dumping Karen, Squidward turning the Chum Bucket into a success, Plankton stealing a priceless work of art, and more! Includes: SpongeBob, You're Fired! Free Samples Karen 2.0 For Here or To Go? Chum Fricassee Move It or Lose It Fiasco! Special Features Sanjay And Craig Episode: Laughquake..
Spongicus: Plankton turns the Chum Bucket into a realistic replica of the Colosseum, complete with a man-eating lionfish! Suction Cup Symphony: Squidward's inspiration for his musical entry in the Bikini Bottom Symphony Orchestra competition...SpongeBob and Patrick! House Fancy: Jealous that Squilliam's on House Fancy, Squidward lures the show's producers to his fancier house. Desperate to make his home presentable, Squidward lets Spong..
Own Spongebob Squarepants - Sweet And Sour Squidward DVD from Deff, DVD, Blu-Ray & 4K Video Specialists - Free UK Delivery..
Own Spongebob SquarePants - The Adventures Of Spongebob Squarepants DVD from Deff, DVD, Blu-Ray & 4K Video Specialists - Free UK Delivery..
Its a race to the South Pole. With the whole town occupied, will Plankton finally get his hands on the formula and end the Krusty Krab's fast-food supremacy for good? Frozen Face-Off: It's a sleigh race for a million-dollar prize! But when things go off course, will everyone band together? One Coarse Meal: Mr. Krabs finds out that Plankton's afraid of whales! Gary In Love: Gary falls for a snail named Mary. The Plays The Thing: Mr. Krab..
Spongebob's Last Stand: SpongeBob and Patrick try to put a stop to the construction of a highway that would destroy Jellyfish Fields! Pet Or Pests: SpongeBob adopts a stray worm that soon gives birth. Anyone want a baby worm or two (or three...)? Komputer Overload: Fed up with constantly having her buttons pushed, Karen leaves Plankton! Gullible Pants: Mr. Krabs leaves SpongeBob in charge of the Krusty Krab for 15 minutes. Overbooke..
Own Sponge Bob Squarepants - The Movie / Spongebob Squarepants - And The Big Wave DVD from Deff, DVD, Blu-Ray & 4K Video Specialists - Free UK Delivery.. He's the wacky underwater star of an oceanful of adventures - he's SpongeBob SquarePants in his original movie debut! Join SpongeBob, his pal Patrick, and the rest of the Bikini Bottom gang as they embark on a thrilling, action-packed adventure. King Neptune's coveted crown has gone missing, and Mr. Krabs is accused of the dastardly deed. It's up to SpongeBob and his nautical cohorts to save the day! Special Features The Absorbing Tale..
Own SpongeBob Squarepants - The Movie DVD from Deff, DVD, Blu-Ray & 4K Video Specialists - Free UK Delivery..
Own Spongebob Squarepants - Treasure Chest DVD from Deff, DVD, Blu-Ray & 4K Video Specialists - Free UK Delivery..
All That Glitters: When SpongeBob's trusty spatula breaks, he replaces it with a new one but discovers that new isn't always better. Whale Of A Birthday: Pearl arrives at her birthday party and is horrified to find that her dad's miserly ways have won out again. Once Bitten: When Gary bites him, Squidward becomes convinced he has a rare snail disease. Chimps Ahoy: Sandy needs to come up with an incredible invention or she'll be forced..
What Ever Happened To SpongeBob? SpongeBob leaves Bikini Bottom, loses his memory and finds himself Mayor of New Kelp City! When Sandy, Patrick, Mr. Krabs and Squidward finally find him, will SpongeBob return to his old life with these “strangers” or remain in the city where he's hero? Goo Goo Gas – In his latest attempt to steal the Krabby Patty secret formula, Plankton turns everyone inside the Krusty Krab into babies. The Two Face..
Own Spongebob Squarepants The Movie / Legends Bikini Bottom DVD from Deff, DVD, Blu-Ray & 4K Video Specialists - Free UK Delivery.. Double bill of animated adventure films featuring the loveable sea sponge. In 'SpongeBob Squarepants: The Movie' (2004), SpongeBob (voice of Tom Kenny) sets off to recover the stolen crown of King Neptune, assisted by his best friend, Patrick (Bill Fagerbakke). SpongeBob's boss Mr Krabs (Clancy Brown) has been accused of the crime, and even though the two of them don't see eye-to-eye, SpongeBob is convinced he is innocent. With Patrick,..
On a mission to save his world, SpongeBob SquarePants is headed to ours for the first time ever! When pirate Burger Beard (Antonio Banderas) steals the secret recipe for the beloved Krabby Patties, SpongeBob and friends must team up to bring it back. But they soon realise that to defeat a super-villain, they must unleash their inner superheroes. Don't miss the hilarious adventure critics are calling "Laugh-out-loud funny" (Soren Anderse..
On a mission to save his world, SpongeBob SquarePants is headed to ours for the first time ever! When pirate Burger Beard (Antonio Banderas) steals the secret recipe for the beloved Krabby Patty, SpongeBob and friends must team up to bring it back. But they soon realise that to defeat a super-villain, they must unleash their inner superheroes. Don't miss the hilarious adventure critics are calling "laugh-out-loud funny" (Soren Andersen,..
On a mission to save his world, SpongeBob SquarePants is headed to ours for the first time ever! When pirate Burger Beard (Antonio Banderas) steals the secret recipe for the beloved Krabby Patty, SpongeBob and friends must team up to bring it back. But they soon realise that to defeat a super-villain, they must unleash their inner superheroes. Don’t miss the hilarious adventure critics are calling “laugh-out-loud funny” (Soren Andersen,..
Collection of nine animated adventures set in the underwater town of Bikini Bottom, featuring the adventures of SpongeBob and his friends Squidward, Mr Krabs and Patrick the sea star. The episodes are: 'Patrick-Man! ', 'Mermaidman Begins', 'Mermaidman and Barnacleboy', 'Mermaidman and Barnacleboy II', 'Mermaidman and Barnacleboy III', 'Mermaidman and Barnacleboy IV', 'Mermaidman and Barnacleboy V', 'Mermaidman and Barnacleboy VI: The Mot..
We’re squeezing out the silly when SpongeBob and Patrick get on the Dutchman’s bad side, devise a way to avoid Squidward and really test their friendship. Join the deep’s best pals along with Squidward, Mr. Krabs and more in seven hilarious tales that will have you drowning in laughter! The Curse Of Bikini Bottom: When SpongeBob and Patrick disturb the Flying Dutchman's slumber, he turns them into ghosts. That Sinking Feeling: SpongeBob..
Christmas Who Procrastination Snowball Effect Survival Of The Idiots Mermaidman And Barnacleboy IV Chocolate With Nuts As Seen On TV Pizza Delivery And Squeaky Boots Special Features Bonus Episodes:, Mermaidman And Barnacleboy IV, Chocolate With Nuts, As Seen On TV, Pizza Delivery, And Squeaky Boots.. It's SpongeBob and Patrick at their sporting best when they try to join Bikini Bottom's number one extreme sports team, The Drasticals! Then, dive into non-stop excitement with a fast-food competition, kah-rah-tay with SpongeBob and Sandy, golf, jellyfishing, a demolition derby starring "The Squish," and more in this collection that gives you a front-row seat to all the action! Includes: Extreme Spots The Fry Cook Games Karate Choppers.. The Great Patty Caper: It's like a whodunit-but more of a whereisit-when SpongeBob, Patrick, and Plankton ride a train in search of the Krabby Patty recipe's latest hiding place. Growth Spout: Pearl's going through a growth spurt! Can Mr. Krabs' wallet survive? Stuck In The Wringer: After his shower, SpongeBob gets stuck in a wringer. Someone's In The Kitchen With Sandy: Plankton disguises himself as Sandy to try to get the Krabby Pa..
Own SpongeBob SquarePants - The Legend of Boo-Kini Bottom DVD from Deff, DVD, Blu-Ray & 4K Video Specialists - Free UK Delivery..
Dear Vikings: With a new Viking-themed promotion at the Krusty Krab, SpongeBob sets out to learn all about them... right from the source! Ditchin': SpongeBob sneaks out of boating class to attend Mermaidman and Barnacleboy's book signing. The Splinter: When SpongeBob gets a stubborn splinter, Squidward threatens him with being... sent home! Slide Whistle Stooges: Patrick and SpongeBob use their new slide whistles to add sound effect.. Fear of a krabby patty - Plankton sets in motion another evil plan to steal the Krabby Patty formula. This one might be just what the doctor ordered! Shell of a man - Mr. Krabs has a reunion of his old navy buddies but he's molted. Not wanting to go without a shell, he disguises SpongeBob as himself and sends him to the reunion. The lost mattress - Mr. Krabs has a lumpy mattress, so Squidward, Patrick and SpongeBob get him a new one and..